Ibiza Spotlight chatted to the pair a week away from their final Ibiza show of the season. Summer is drawing closer to its end. The days are shortening and one-by-one the closing parties are slowly happening. It's been a season of change in San Antonio, where open-air parties have played an important part in strengthening Ibiza's clubbing allure. Ibiza Rocks Hotel has been a champion of the concept for over a decade now. Its poolside events are synonymous with the island's party DNA. 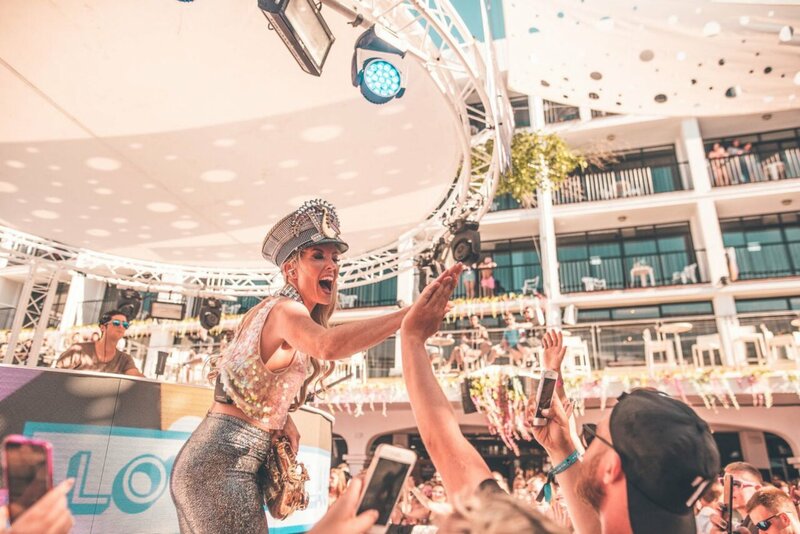 Dancing in the sunshine is still what makes Ibiza special – so it's no wonder that the San Antonio venue is enjoying one of its best summers to date. Ibiza Rocks Hotel made bold decisions with its programming this time around. Popular residencies such as Craig David's TS5 and Cuckoo Land have returned this season, but newer faces also rocked the poolside dance floor just as hard. Lovely Laura and Ben Santiago are two of those new faces, yet the two are far from being strangers to the island. Ben – an integral member of one of the island's favourites Melon Bomb – has honoured the decks in the super-clubs for years. In regards to Laura, she has been soundtracking sunsets with her saxophone since she first arrived on Ibiza in 1999, making a name for herself at Privilege with the infamous Manumission. We sat down with the pair at one of their favourite chill-out spots, Las Mimosas in San Antonio, a week ahead of their final Ibiza show at Ibiza Rocks Hotel on Thursday 20 September. The saxophone and DJ combination has worked wonders this summer at Ibiza Rocks. The pair has already played twice in both June and August, with their final date scheduled for 20 September. On stage, Ben and Laura ooze charisma with energy in abundance and smiles aplenty. But despite the wealth of performance experience between them, butterflies remain. “The first time we were so nervous,” Ben explained. “Having your own party brings a whole other level of pressure. We've never really done that; instead, we're used to being guests at someone else's event. Laura – who, like Ben, has played at some of the world's biggest festivals and events – shared the same sentiment. “When we opened there in June we were both really nervous because we had no idea,” she said. “It's a venue we've never really played before, so you don't know how it would work, how the crowd would work and if they would like us." Historically, Ibiza Rocks Hotel favoured live performance with instruments in the past. For a variety of reasons, it has shifted to programming parties that focus more on DJs, singers and MCs in recent times. Despite this change, the feedback from the crowd reactions has spoken for itself. Irrespective of this, Ben Santiago and Lovely Laura's residency is unique. The performance marries both a modern and classic way to play music. It's something that has helped bring this immensely talented pair to the top of many promoters' hit lists. “I've been doing this for a long time now (using a DJ with a live instrument), but I think it has really taken off in the last few years,” Laura said. “What I found when I first started was that people were coming up to me and saying that it was lovely to listen to a DJ with a live element as well." Summer 2018 marked the pair's first true residency together on the island. This is their party and they both enthused about the moment Ibiza Rocks approached them at the start of the summer. “[We were] very happy,” Ben said. “You look at who you're sharing the week with - Craig David, Rudimental, MK, Stormzy, Cuckoo Land, the list goes on. Laura spoke about the feelings that came over her. “Kind of surprised and honoured,” she added. “It was a mixture of all sorts of emotions. It was really quite exciting." The charming couple has been a staple of the summer's festival circuit both around the world and in clubs across the island. It's this relentless touring attitude that has helped take their act to all four corners of the globe. This year's winter plans may be different to previous, with a schedule in the making that favours more time in the studio. “I've always loved making music for years,” Laura explained. “We've always wanted to do that, but time is just the issue. You're busy gigging all the time so you don't have that time to get that creativity." “Creativity comes when it wants to come. It's not a switch that you can press and then write a hit." That time was worth taking. Their single Just Want Your Body has proved to be a massive hit this summer. “It's amazing playing your own track at a gig and people responding to it,” Laura smiled. The positive side of such work ethic shines through, despite the much-reported rigours of performing throughout busy periods of the year. Having married in 2012, the saxophone and DJ pairing share a unique relationship. They bestowed their affection for one and other not only as husband and wife but also as performance partners. “It's a massive, massive blessing,” Ben said. “It may sound a bit cheesy, “ he laughed, “but to have your soulmate and your companion with you not only to share the journey but also to support each other is a real blessing." "DJs talk about the loneliness about being on the road and how hard it can be. We don't have that issue." It's this closeness that transcends onto the stage and into their performance. The two have a chemistry that brings the whole party together. This chemistry will be flowing in full force at their final Ibiza Rocks show, where nerves back in June have turned to excitement. “It [their Ibiza season] started at Ibiza Rocks and it will end at Ibiza Rocks,” Laura said. “I'm buzzing already. There's been a lot of hype on social media and I know people who have especially bought tickets to come over for the event." “It's an amazing venue,” Ben added. Lovely Laura and Ben Santiago close out their fantastic debut residency at Ibiza Rocks on Thursday 20th September. Get that air sax at the ready and secure your ticket below for their final Ibiza show of 2018.